Conifers are often valued as windbreaks and visual screens. In the garden, their myriad forms, distinctive textures, and all-season color make them important as structural elements and backdrops for other vegetation, design techniques that conifer devotees use with particular skill and creativity. Yet the ecological role of conifers, especially with regards to our native wildlife, remains largely unappreciated by many gardeners and landscape designers. While most any conifer, regardless of nativity, offers some degree of nesting and cover for wildlife, conifers indigenous to North America afford all the components of habitat (i.e., forage, nesting, and cover). How native conifers host our wildlife is fascinating and can be readily observed on residential properties. These host relationships also hold significance for gardeners and conifer aficionados alike. As residential and commercial development converts needleleaf forests to landscapes of turf and non-native ornamentals, bird species such as crossbills (a small bird in the finch family) find it difficult or impossible to meet their food and nesting needs. Crossbills use their uniquely evolved offset mandibles to access seeds inside spruce, pine, and fir cones. One study found that to survive a typical northern winter crossbills need to eat spruce kernels approximately every seven seconds during daylight hours. Birds and small mammals that cannot actively shred cone scales retrieve seeds dropped by crossbills (as well as red squirrels). Owls and hawks in turn prey upon these ground-feeding animals. North America’s four species of hemlocks provide forage for more than twenty known insect species. Birds that nest in hemlock’s dense foliage include the veery, the golden-crowned kinglet, the dark-eyed junco, the pine siskin, the sharp-shinned hawk, and numerous warblers (one of which is even known as the hemlock warbler). Similarly, the needles on North America’s nine fir and seven spruce species feed over 150 known species of moths and butterflies while songbirds and small mammals eat the seeds, and animals of all kinds nibble on needles and young twigs, particularly in winter when other food sources are scarce (one animal, the spruce grouse, actually changes the size of its intestinal tract in the winter in order to process the resins and terpenes in conifer foliage). Yellow-bellied sapsuckers make feeding wells in fir bark, and solitary vireos, yellow-rumped warblers, and evening grosbeaks can frequently be found nesting in firs within their native range. Meanwhile, prostrate conifers like Canada yew (Taxus canadensis) function primarily as cover and nest sites. Select conifers native to your ecoregion. They will be better adapted to your local conditions and will best match the needs of wildlife indigenous to your ecoregion. Use local genotypes if possible. A plant originating thousands of miles away from your home landscape may not be suited to the conditions of your garden and in some cases may adversely affect the genetic integrity of local native plant populations. Know a plant’s reproductive requirements. Some conifers are dioecious (male and female flowers on separate plants). Female Juniperus virginiana, for instance, produce fleshy blue, berry-like cones, and a good fruit crop depends upon male and female trees in proximity. By utilizing traditional design principles, native conifers such as the Chamaecyparis thyoides ‘Andelyensis’ in this scene can be integrated into a variety of garden settings. Numerous resources exist for those interested in using native conifers. Tallamy’s Bringing Nature Home lists conifer species (as well as other native plants) by major geographic region. Edward Cope’s Native and Cultivated Conifers of Northeastern North America (Cornell, 1993) and Michael Dirr’s classic Manual of Woody Landscape Plants (Stipes, 1998) describe hundreds of native conifers and their cultivars. Helpful online starting points include The Gymnosperm Database and sites like www.plantnative.org and www.for-wild.org. Naturalist groups, native plant societies, and local chapters of organizations like the Sierra Club also provide an excellent source of first-hand experience, in addition to the camaraderie of shared interests. Conifer aficionados appreciate and use conifers with a special zest, creating unique collections that reflect their horticultural interests and personal tastes. This practice dates back over five hundred years when wealthy, botanically minded Europeans assembled living collections of exotic and curious plants that often included vegetation of North American origin (Thuja occidentalis, for instance, was grown in Paris as early as the sixteenth century ). Arguably these early collections had less need to fulfill ecological functions in a less fragmented environment subject to fewer human pressures. Today, with nowhere on the planet untouched by human influence, the stakes of this practice are quite different. With substantial modifications to our natural environment comes the burden of responsibility—as well as the potential for new meaning and fulfillment for those who put spade to earth. “Gardeners have the opportunity to make a difference,” writes Tallamy, “in this case the ‘difference’ will be to the future of biodiversity, to the native plants and animals of North America and the ecosystems that sustain them.” Plant collections remain viable and satisfying pursuits capable of expressing personal creativity, but they can—and arguably must—now be enriched by new ecological knowledge (like that advanced by Tallamy) that can transform them into functioning, dynamic plant communities rather than biologically static assemblages of individual specimens. Benefits of using native conifers of course extend beyond providing wildlife habitat. When properly sited, native conifers require limited inputs and are generally adapted to local weather patterns. (Hemlock’s slender outer branches, for instance, easily shed snow, thereby limiting winter breakage.) 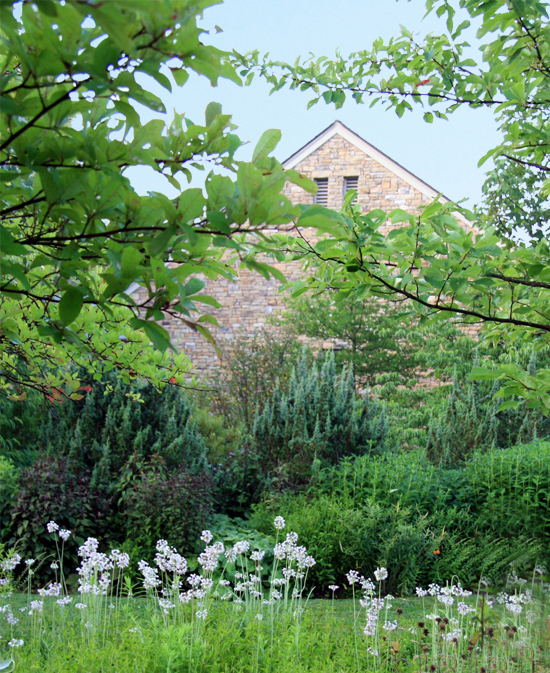 Use of native plants also expresses regional character in an era of landscape homogenization. Using native plants cannot deliver us to a pure, mythical eco-utopia but it can help us to (re)develop landscapes that are not only biologically diverse and resilient but also beautiful. Such an approach benefits wildlife and ultimately the ecosystem services we all depend upon, but it also offers us something even more, something akin to mystery and a sense of connection in our own backyards. By consciously engaging with the dynamics of our regional ecologies, we do more than seek to sustain our world—we find ourselves cultivating the wondrous processes of life itself. Larry Weaner has been a landscape consultant, author, lecturer, and educator for over thirty years. In 1982 he founded Larry Weaner Landscape Associates, a firm known for integrating the traditions of garden design with the science of ecological restoration. His design and restoration projects have received national awards and been featured in numerous publications. In 1990 Larry developed New Directions in the American Landscape, a national conference series dedicated to the study of natural landscape creation and restoration. He is a past Board Member and Environmental Committee Chair of the Association of Professional Landscape Designers. Jenna Webster is a designer with Larry Weaner Landscape Associates. She received a master’s degree from the Conway School, a graduate program in sustainable landscape design and planning. See www.fs.fed.us/land/ecosysmgmt/ for a map and descriptions of the ecoregions of the continental United States. See Douglas Tallamy, Bringing Nature Home: How You Can Sustain Wildlife with Native Plants, Updated & Expanded (Timber Press, 2009), 172. Unless noted otherwise, all insect data cited comes from Tallamy. See M.B. Dickinson, Field Guide to the Birds of North America (National Geographic Society, 1999). See Tallamy, “Gardening for Life,” http://bringingnaturehome.net/native-gardening/gardening-for-life, accessed May 12, 2010. Cited in Charles Fergus, Trees of Pennsylvania and the Northeast (Stackpole, 2002), 14. For a list of the handful of problematic non-native conifers see www.invasiveplantatlas.org. See Donald Culross Peattie, A Natural History of Trees of Eastern & Central North America (Houghton Mifflin, 1991), 67.